Kids' Book Review: Review: Line Up, Please! Sometimes a book comes along that just so delights you, you feel like you're two again. And as a sense of delight is something we should regularly pursue, what better way than via the pages of a book? In Line Up, Please! 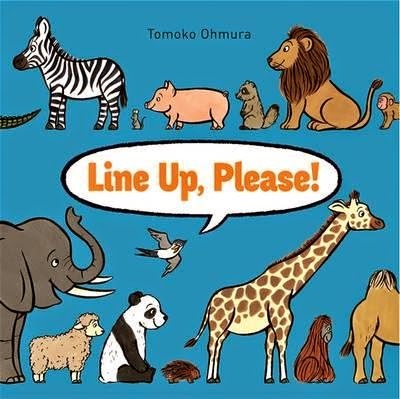 Tomoko Ohmura has created a charming storyline around a line of queueing animals--all numbered and chattering away amongst themselves. But what are they waiting for? As the book progresses, a gull flies over the queue, reminding everyone to stay in place and be patient until they can get started. Some animals are getting bored, some are a little nervous, some are happily playing or chatting. It's actually a lot of fun to eavesdrop on what each animals is getting up to and how they're dealing with the queue! Eventually, we reach the front of the line--a large grey elephant. He's about to step onto something, but what could it be? A double page/double full-page flip-out reveals exactly what it is, stretched over four pages! And that's when we realise the animals have been arranged according to size. This is a vibrant, active, highly entertaining book both adults and kids will love working through. And the action-packed ending will also delight.